His latest stickup came on Wednesday at the San Diego National Bank around 5:50 p.m. According to the FBI, the notorious robber was armed with a silver and black semiautomatic pistol when he handed the teller a demand note. He walked off with an undisclosed amount of money. Rail-thin, clad in a baseball cap and brandishing a gun, the man held up his first bank in San Diego County on Aug. 28. Up until mid-November, he had been robbing a new bank in San Diego County every two to four weeks, authorities said. But this time, he waited about two and a half months before pulling off another robbery. 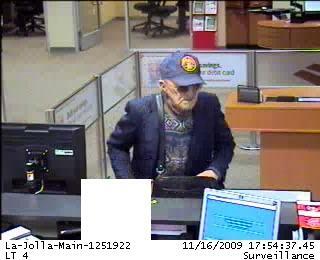 His last heist had been Nov. 16 at a Bank of America branch. Posted: 1/30/10 at 2:05 PM under FBI, News Story.